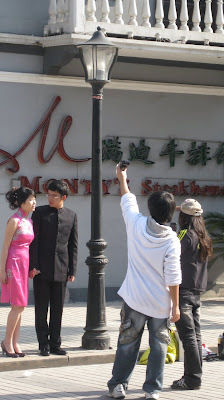 Maybe I just haven't lived here long enough, but I don't understand modern Chinese weddings. After the Official Registration Process, you have a small, understated do in a restaurant somewhere (the groom will probably wear jeans). The bride might splash out on a new dress for the occasion, but the main emphasis will be on food and drink. Lots of drink. Then, the money and energy you would have otherwise spent on the wedding itself can be invested in the purchase of a very expensive set of Themed Wedding Photos. 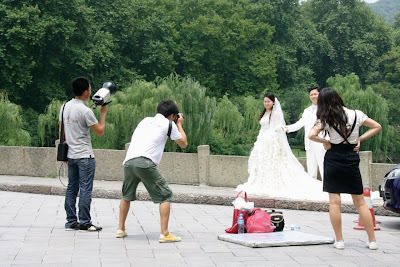 For this you will have to find the right Themed Wedding Photo Shop. There are dozens of them on Huai Hai Lu. Here you can spend hours with a consultant (aka shonky salesperson) poring over 'lookbooks' of different wedding photo styles and backgrounds. Western style is the most popular, but you can have Traditional Chinese, Salsa, Scottish, Scarlett O'Hara or anything in between. Then, on a completely different day, usually in the months after your actual wedding, you and your beloved will get up early, climb in a minibus, and be driven to your chosen scenic destination. 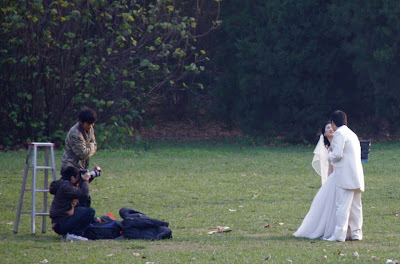 Here, in the nearest public toilet, you will change into the hired wedding outfit, have your hair and make-up done, and with a photographer, gopher, lighting guy and stylist have your themed photos taken. This will cost you quite a small fortune. 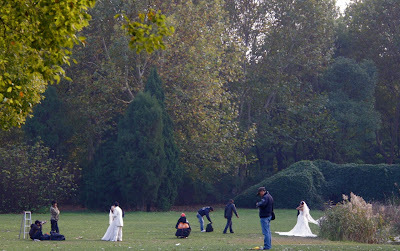 I'm so glad that the rip-offs applied to weddings in the West have also found their way to the East. You can save a bit of money by travelling in a group! ..........like outside our local fine-dining establishment, Monty's Steakhouse. Now that would make a unique set of wedding photos.